Learning Korean is a pretty tough challenge for English speakers but it can be done and it is a rewarding accomplishment. how hard is it to learn Korean for English speakers? It’s truthfully one of the hardest ones out there. It takes time which can be a hard commodity to come by in our busy lives. If you need to travel to Seoul on business, though, or want to take a vacation to Ggotji Beach you’ll need to cram in as much learning time as possible. how long will it take to learn Korean depends, of course, on a number of factors. There isn’t any one answer to this question as it relies on personal circumstances. Here are the main factors at play that will determine how long it will take you to learn Korean. If you were raised bilingual or learned a foreign language in school you will have a leg up when it comes to learning Korean. People that speak two languages have a lot easier time learning a third one. That being said, even if you can only speak English you can still learn Korean it will just take longer. The first step is to learn what Korean is all about and what makes it unique. You will need to learn to speak new sounds and a different alphabet. A lot of learning a language comes down to repetition and lots of exposure to the new language. While Korean is considered one of the hardest languages for English speakers the good news is that they do use some words that have been borrowed from English. One thing you can start with is Konglish which English words used in a Korean context. These words have blended Korean and English together and include words such as radio, computer, and ice cream. Some Korean words sound like their English counterparts which makes them easier to remember. One example is the Korean word for child which sounds like “eye”, a lot of which sounds like “many”. 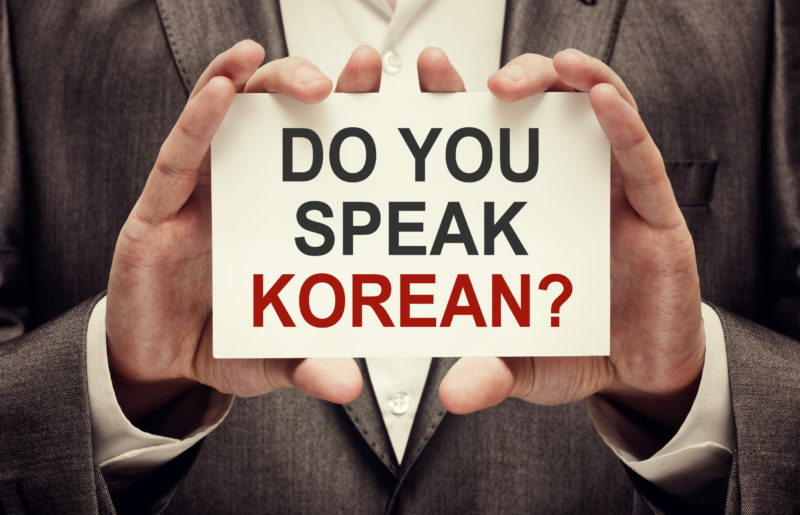 Consider these words your friends and gateway to the broader Korean language. How you learn will affect how long will it take to learn Korean. If you are only learning this language inside of a classroom it will take substantially longer than if you are immersed in the language. If you read books in Korean, watch Korean TV shows, listen to K-pop, or travel to South Korea your speed at acquiring this language will be greatly impacted. If you can dedicate an hour each day to learning Korean you will pick it up much faster than just doing something like attending a weekly class. This time can be spent in a variety of ways such as using flashcards, watching a Korean movie, or listening to a Korean radio broadcast. There are online programs that really encourage you to study Korean on a daily basis. One of these is Rocket Languages which encourages access their website on a daily basis. The fastest way to learn is to get as immersed in the language as is possible. Motivation lies at the heart of acquiring a new language. If you stay motivated you will find success learning Korean while if you fall by the wayside you won’t. Remind yourself from time to time on why you wanted to learn Korean in the first place. So how long will it take to learn Korean? All of the above factors will together impact how long it takes you to this language. It will also impact how hard is it to learn Korean for English speakers. There have been studies that help to determine how long it will take you to become a proficient Korean speaker. The good news is that even those who are at a lower-level intermediate level of Korean can do pretty well in that country. Studies show it takes around 1,000 to 1,200 hours of classroom instruction to learn Korean for English speakers. How many years will it take to learn Korean depends on how often you attend a class. If you have 3 hours of class a week, plus an hour homework, plus two hours of independent studying it will take around 8-10 years. If you want to know how to learn Korean in a year than you will need to add together all of your study time to see how long it would take to hit 1,000 hours. If you spend three hours a day you can do it inside of a year. Another way to know how to learn Korean in a year is to fully immerse yourself in this language which means 8 hours a day spent only hearing and speaking Korean. If you are in Korea and expose to it throughout your waking hours you could learn Korean at an intermediate level in as little as three months. The FSI has created five language groups for how hard it is to learn another language for English speakers. The easiest include Dutch, French, Spanish, and Swedish among others. These take around 23 to 24 weeks or 575 to 600 hours. This is Language Group I. Language Group II, specifically German, takes 30 weeks according to the FSI. Language Group III is made up of Swahili, Malaysian, and Indonesian. These take 36 weeks. The next group has languages such as Burmese, Russian, Turkish, Vietnamese, and Icelandic, These take 44 weeks. The Korean language falls into Language Group V, the hardest group. In addition to Korean, these languages are Mandarin Chinese, Cantonese Chinese, and Arabic. These take 88 weeks according to the FSI with 2,200 hours of study. How many years will it take to learn Korean, though, doesn’t depend on just the quantity of the time spent learning it but also the quality. If you dedicate yourself and spend time learning it each day you can learn it in under a year. You will be comfortable traveling in Korea and shouldn’t run into any problems having everyday conversations with others. Like any skill practice makes perfect so with the right attitude and dedication you will learn Korean before you know it.